Chillipop is the latest addition to Betsoft Slots3 series of visually-appealing action-packed games with intensive graphics and sound effects. Set in the scenery of a peaceful Mexican village, the game works in both free play and real money modes offering a 5000-coin jackpot, Cluster Wins, Wilds, Scatters and Free Spins. This is a 5-reel 3-row 9-payline slot machine and you can get valuable tips and learn how to win its main prize after reading the Chillipop slot review. Tired of reading? See the ChilliPop screenshots below and then claim one of the bonus offers of our recommended casinos to play for free or real! In terms of the gameplay, we have an interesting mechanics where symbols appear on the reels in a cascade style. It takes 3 or more matching icons to get paid where peppers of all sizes and colors have a bit higher rating than themed icons such as donkey or doll. The most lucrative way to receive a prize in the base game leads through Cluster Wins – a 3x3 cluster of matching icons that eventually leads to a 5000-coin jackpot. The winners will achieve this big win only after 5 Wilds appear on an active paying line. Before making any move, players can set a betting strategy and coin values that range from €0.01 to €20. Accordingly, you’ll receive a higher or smaller Chillipop bonus prize. 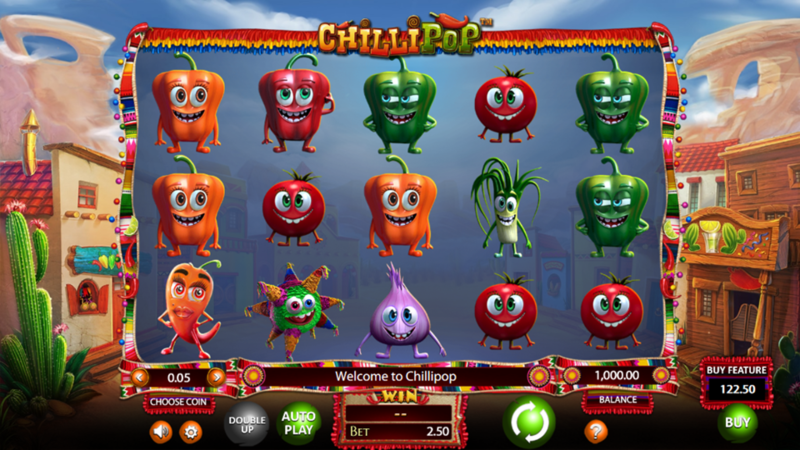 The Chillipop free spins round starts after collecting 3, 4 or 5 Scatters. This will trigger 12, 24 or 36 spins at no extra cost, while another chance to receive more coins leads through the Gamble feature. Try to guess the outcome of a card appearing the next and double your winnings or lose it all upon a wrong guess. Thanks to the latest HTML5 technology, you can play online using any modern mobile device. There is no need to download the iPhone app or the Android .apk file for this purpose. 3. What is the RTP factor of ChilliPop? The RTP official info will be announced as soon as we close our research around the Betsoft-powered sites. Closing the Chillipop recension, we can say this is an interesting game to pass your time, even if you’re not a huge fan of a fruity-packed paytable. Since the jackpot won’t change your life substantially, try to make a small impact on your everyday expenses and pass a quality time.